Today is Monday, August 13th, 2018. I’m Kevin Boyle, with today’s W-V-B-I Community Calendar. Yoga all this week at the BIC Center. Basic Yoga Monday and Friday at 9:30. Therapeutic Yoga Monday at 11. Restorative Wednesday at 9:30. BICS School Board meeting this evening at 7 at the school. Tuesday: Computer, tablet and smartphone workshop here at the BIC Center. That’s 10 to noon with tech guru Pat Bonadeo. Also Tuesday, the Beaver Island Transportation Authority Board meets at noon at their office on main street. And, the Peaine township Planning Commission meets at 7 at the township hall. Wednesday, BINGO over at the Gregg Fellowship Center. Doors open for fellowship at 6:15. Ganes at 7. Thursday: Farmer’s Market at Paradise Bay Coffee Shop. Lots of vendors as gardens are coming in with lots of fresh, local produce. Also, baked goods – bread and pies—canned goods (pickles, fruit, jams and jellies – cookies and fudge – and more. Plus you can drop into the Coffee shop for, well, coffee or breakfast or lunch – and some Beaver Island roasted coffee. Also Thursday, Games Galore here at the BIC Center from 1 to 4. And Thursday evening, the Historical Society Board meets at Peaine Township Hall at 7. Friday: Art in the Harbor out in front of the BIC Center from 10 to 2. Saturday: Lego club at the library at 1. And movies at the BIC Center: Rock Dog at 3 and Avengers Infinity War at 7. And, more great music coming to the BIC Center. At the end of the month The Way Down Wanderes will be here. They aren’t limited by genere. They just play great music. Foot stamping fun say the critics. They’re at the BIC Center August 31st at 8. And, coming in September, it’s the Kennedy’s. More foot stomping fun from a band that does everything Irish. The Kenedy’s will be in the Robert Gillespie Memorial Theater on September 22nd at 8. Tickets for both events are available now at the BIC Center fron t desk or by calling 448-2022. And make a note of this for your end of summer clean-up. Hazardous waste collection days are planned at the Transfer station on the 31st and September 1. You can find more information on all of these events and everything else we know about that’s happening on the island at calendar dot w-v-b-I dot net. If we’ve missed your event you can easily add it yourself by using the handy “Post Your Event” button in the upper right of the calendar. Post it there. Hear it here. See it on the digital signage around town and across—and on other Beaver Island websites. It’s one and done with the W-V-B-I – BIC Center Community Calendar. Clear, with a low around 66. Southwest wind around 5 mph. A 20 percent chance of showers after 2pm. Sunny, with a high near 81. Southwest wind around 10 mph. Cloudy overnight. Low around 59. Partly sunny, with a high near 73. Northeast wind around 10 mph. S wind 5 to 10 kt. Sunny. Waves around 1 ft.
WSW wind around 10 kt. A slight chance of showers and thunderstorms after 2pm. Waves around 1 ft.
At 6 this morning at the pest free Hogarth Pest Control Studios of W-V-B-I –it was 67. Winds mostly calm with an occasional breeze from the SSW. Humidity still high at 95%. Dew point 66. Pressure 29 point 5-5 and falling slowly. Visibility 10 miles. Around the island at 6… it was 66 at Whiskey Point, 65 at McCauley’s Point, 65 on Greene’s Bay, 70 on Lake G and no report from our transmitter site. Water temps: 68 at White shoal, 71 in Little Traverse Bay and 70 at the mid-Lake bouy southwest of Gull. Nice and warm. Sun sets at 8:57 today. Up around 6:36 tomorrow. 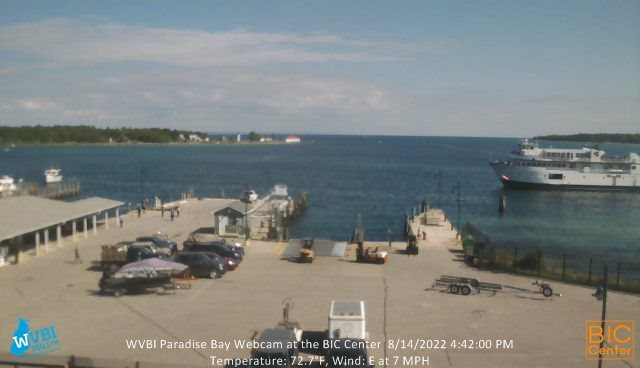 Looking out on Paradise Bay at 6 from the Hodgson Enterprises W-V-B-I BIC Center webcam—harbor had just a few smooth waves. Gorgeous sunrise underway. Summer haze overhead. TRAFFIC: None. Island beltway running smooth. Bridges clear. No delays inbound or outbound to either airport. But, it gets busy in town as the day moves on—especially when the ferries come in. So let’s be careful out there. ON THIS DATE of August 13, 1961, shortly after midnight, East German soldiers begin laying down barbed wire and bricks as a barrier between Soviet-controlled East Berlin and the democratic western section of the city. After World War II, defeated Germany was divided into Soviet, American, British and French zones of occupation. Cut off from its western counterpart and basically reduced to a Soviet satellite, East Germany saw between 2.5 million and 3 million of its citizens head to West Germany in search of better opportunities. By 1961, some 1,000 East Germans–including many skilled laborers, professionals and intellectuals–were leaving every day. From 1961 to 1989, a total of 5,000 East Germans escaped; many more tried and failed. High profile shootings of some would-be defectors only intensified the Western world’s hatred of the Wall. On November 9, 1989, masses of East and West Germans alike gathered at the Berlin Wall and began to climb over and dismantle it. As this symbol of Cold War repression was destroyed, East and West Germany became one nation again, signing a formal treaty of unification on October 3, 1990. Phyllis asks: DID YOU KNOW THAT Celery has negative calories! It takes more calories to eat a piece of celery than the celery has in it to begin with. Of course you can fix that by putting a little Win Schuler’s cheese right in that handy trough in the celery. That’s what it’s there for. WORD OF THE DAY: laeotropic (lee-uh-TROP-ik) which means oriented or coiled in a leftward direction, as a left-spiraling snail shell. The adjective laeotropic “turning leftward” is restricted to describing snail shells. It entered English in the 19th century. Birthdays: Lots of them this weekend. On Saturday, Gus Connagham, Kellie Gillespie, Randy Osborn, Jamie Campbell, Cat and Connor Williams and J-P Stigall. Sunday: Dan McDonough, Steve West, and Jacqueline Martin. Today: Tina Morgan and Becky Gerace. Happy birthday to the whole raft of them! If we missed you on our list, happy birthday to you as well. Here’s a thought for today: Change your thoughts and you change the world. What position did the Kool Aid man play in the Homecoming baseball tournament? He was the relief pitcher. That’s the W-V-B-I Community Calendar for Monday, August 13th, 2018. I’m Kevin Boyle at W-V-B-I‚ the Voice of Beaver Island wishing you a great day and asking you: why not make it the best day ever? And, thanks for listening.